Assassin’s Creed Anthology is Out Soon. Also My Thoughts on What is Cheaper Digital or Physical? The new age battle of digital vs physical. Soon on the 30th November PlayStation 3 and Xbox 360 owners will be able to own every Assassin’s Creed game and DLC add-on for a total of £119.99 the publisher Ubisoft announced last week with the Assassin’s Creed Anthology pack. I will in this post explore whether you save more money if you buy them all individually via digital distribution than just getting the Assassin’s Creed Anthology pack instead. The Assassin’s Creed Anthology Edition is available exclusively from Amazon. PlayStation 3 and Xbox 360 versions are listed but it wont be available for PC for the time being. Its worth noting that the pack includes the recently released Assassin’s Creed III and Assassin’s Creed III Season Pass which is a total value of £60.55. 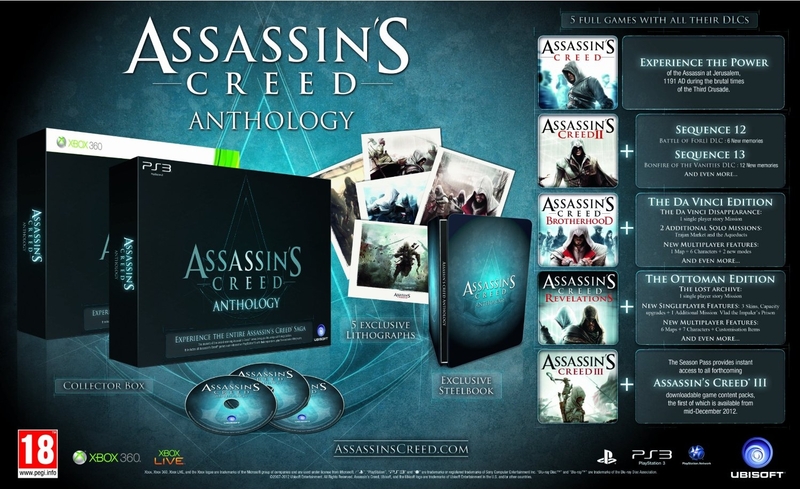 Which should give some indication of the value of the Assassin’s Creed Anthology pack. Assassin’s Creed, Assassin’s Creed II, Assassin’s Creed: Brotherhood, Assassin’s Creed: Revelations and Assassin’s Creed III. DLC for all five Assassin’s Creed games. Assassin’s Creed II Also includes: Sequence 12: Battle of Forlì DLC and Sequence 13: Bonfire of the Vanities DLC. Also includes: The Da Vinci Disappearance: 1 single player story Mission 2 Additional Solo Missions: Trajan Market and the Aqueducts New Multiplayer features: 1 Map + 6 Characters + 2 new modes. Also includes: The lost archive: 1 single player story Mission. New Single player Features: 3 Skins, Capacity upgrades + 1 Additional Mission: Vlad the Impaler’s Prison. New Multiplayer Features: 6 Maps + 7 Characters + Customisation Items. Also includes: The Season Pass, providing instant access to all forthcoming Assassin’s Creed III downloadable game content packs, the first of which is available from mid-December 2012. Now to see if you will save money by buying the Assassin’s Creed Anthology I am going to use Microsoft’s Xbox Live Marketplace digital prices as a comparison to the Assassin’s Creed Anthology price. Assassin’s Creed II is £11.99. Sequence 12: Battle of Forlì DLC is 320 Microsoft Points (£2.74). Sequence 13: Bonfire of the Vanities DLC is 320 Microsoft Points (£2.74). Assassin’s Creed: Brotherhood is £19.99. The Da Vinci Disappearance DLC is 800 Microsoft Points (£6.85). Assassin’s Creed: Revelations is £19.99. Assassin’s Creed III is £39.99 (unavailable digitally). Assassin’s Creed III Season Pass is 2,400 Microsoft Points (£20.56). Therefore you save £16.85 with the Assassin’s Creed Anthology pack compared to the prices on the Xbox Live Marketplace. It also includes everything in physical form and a collector’s box, exclusive steel book and five lithographs. If you were to buy it all on the Xbox Live Marketplace you would make a loss of £16.85 compared to the Assassin’s Creed Anthology and you wouldn’t have no physical material to show for it except Assassin’s Creed III which isn’t digital at the moment. A clear choice then? I know what I will be getting. I only have Assassin’s Creed and Assassin’s Creed: Brotherhood and no DLC for it so I am technically making a small loss if I was to get the Assassin’s Creed Anthology but I would have a physical collection compared to a digital one. Of course you can save some money by shopping in the right places but that’s a lot of work for old copies of games. I am glad I didn’t buy all the Assassin’s Creed games as they came out because I can benefit from this pack as I adore the Assassin Creed series. I must say I am a big fan of digital distribution but if you aren’t giving competitive prices for a version which is basically inferior, as it doesn’t contains all the trimmings compared to a physical copy of the same game. Such as no DVD, manual (even if small) or box then physical distribution will always in my opinion win. However I must say that the Assassin’s Creed Anthology art on its physical media is more general than the individual games in the series. Therefor you could argue that it’s a close as possible as getting a digital collection in physical form. There’s not much individuality in the pack. However its still worth getting especially if you have only one or two games in the series or none at all. If anything digital versions of games should be about 30% cheaper than a physical version of the same game. All Assassin’s Creed III Videos, Screenshots and Artwork [Updated! ].